The best thing about hand-crafted Persian rugs is that, unlike machine-produced rugs, they're all unique. No two are the alike because no two handmade rugs can be identical. Each is beautiful in its own way, with its own patterns and designs. However, most Persian rugs can be placed in broad categories based on similarities of layout. The three broadest categories we can place all Persian designs into are: Geometric designs; curvilinear and floral designs; and pictorial designs. Plus, each group has many different styles, and sometimes one carpet can incorporate more than one design. All the carpets in this group are decorated with repeated linear elements of vertical, horizontal, and diagonal lines, usually woven by nomadic tribes using particular traditional and cultural symbols. Most of the elements are symbols of something special or sacred, cherished by that tribe for hundreds of generations. Because they're made by hand in the most primal conditions, tribal pieces usually don't have full symmetry or color consistency, thus giving them a 'primal' quality. Some cities and villages that weave beautiful geometric rugs include Heriz, Hamadan, and Shiraz. Most elements in Persian rugs have great meaning and reflect their close affinity with nature. That's why nature in some form whether in small plants and flowers or delicate animals can be seen in almost all carpets. 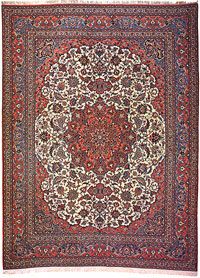 In most Persian rugs, the most common motif is the central medallion, and even though two may look similar, no two medallions are completely identical. Some experts believe that the medallion design stems from the spiritual nature of the weavers and that their inspiration probably came from the domes of the Mosques. When discussing fine Persian rug patterns, it helps to be familiar with the Safavid Dynasty in Iran, especially the era when the Great Shah Abbas was king. He is the one that springs to mind as the inspiration for various patterns, all of which feature the lily in an isolated central position linked only by delicate tendrils. 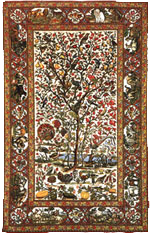 Often, you will see a rug classified as a Shah Abbasi design. Shah Abbas was responsible for a large portion of the Persian rug industry by setting up royal rug factories all over Iran and making Isfahan the country's capital. Today, a Shah Abbasi is among the finest Persian rugs available. The Herati pattern -- a central diamond shaped figure forming the medallion while also a border to another similar medallion, which is another border to another inner medallion -- is found in rugs from around Iran, although almost all rug producing countries have made this design one time or the other. It is probably one of the most famous designs, deriving from the town of Herat, now in Afghanistan but once part of the Persian Empire. Perhaps the rarest of Persian rug styles is the pictorial design. This type of pattern doesn't follow a standard outline and each rug is unique in its details. The weaving of a pictorial rug demands much more skill from the weaver. They must be great artists because unlike curves, circles, or repetitive floral elements, it is more difficult to weave details and smaller elements that require great accuracy. This style of weaving was initiated in Iran several hundred years ago when artists and poets wanted to express themselves by means other than paper. It is important to understand how proud the Persians were of their history and culture. Seeing how weaving has always been a big part of the artistic expression of Persian culture, the two were combined to preserve a moment of their history in a beautiful rug. The Iran Carpet Company, a specialist in the subject, has attempted to classify Persian carpet designs and has carried out studies of thousands of rugs. Their results show that there have been slight alterations and improvements to almost all original designs. In its classification the company has called the original designs as the 'main pattern' and the derivatives as the 'sub patterns'. They have identified 19 groups, including: historic monuments and Islamic buildings, Shah Abbassi patterns, spiral patterns, all-over patterns, derivative patterns, interconnected patterns, paisley patterns, tree patterns, Turkoman patterns, hunting ground patterns, panel patterns, European flower patterns, vase patterns, intertwined fish patterns, Mehrab patterns, striped patterns, geometric patterns, tribal patterns, and composites.